The President of the Greek Community of Melbourne, Bill Papastergiadis, with Board Members Alexi Costa and Angela Georgalis met with Lord Mayor candidate Ken Ong. Ken congratulated the Greek Community of Melbourne on its unifying force not only amongst the Greek organisations in Melbourne but also as a strong example for all other multicultural communities. 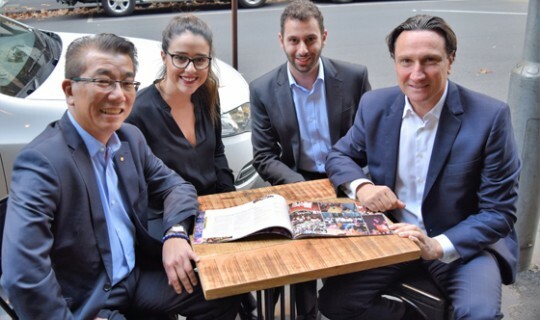 Ken Ong stated that he is a strong supporter of the Greek Community of Melbourne and will work to ensure that its core activities are appropriately supported by the Council. In particular, Ken stated that the Lonsdale Street Festival is an event that requires the strong support of the City of Melbourne. It is well run and attended by people from all over Melbourne, including Ken himself. It is an important part of the cultural fabric of the city and acknowledged that the Council needs to do more for the festival. Ken Ong congratulated the President and the current Board of the Greek Community of Melbourne for reinvigorating the Lonsdale Street precinct such that it now has over 100 members. Alexi and Angela told Ken that the Greek Community of Melbourne look forward to working with the Council to reduce the cost of producing the festival, particularly in respect of the infrastructure requirements of Council. Bill Papastergiadis thanked Ken Ong for his strong support of the Greek Community of Melbourne during his tenure at the City of Melbourne. He is a good friend of the Greek Community and somebody we have worked closely with for a number of years, and in particular, was instrumental in the planning deliberations for our 15-storey Greek Cultural Centre.